You don't have to travel abroad to have a honeymoon. Many couples who can't afford to leave Nigeria end up skipping the honeymoon- which is really sad because we happen to have some awesome spots right here in Nigeria to have a magical honeymoon. Why go somewhere with unfavourable weather especially this time of year, when you could be having the time of your life loving up with your new spouse in a sweet corner of Naija? 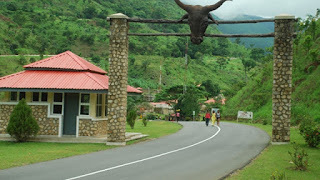 Also known as Obudu Mountain Resort, this is a paradise on earth. Located in Cross River, there is the overwhelming lush greenery surrounded by undulating mountains. If you're a couple that loves serenity, you would fit right in. Activities include hiking, bird watching, horse riding, golfing and riding on the cable car to have a better view of the ranch. Abuja is another stop for your romantic storybook. Apart from the mountains surrounding this city, it is blessed with beautiful scenery and most definitely a haven for lovers. One of the favorite places to be is Usman Dam. After hiking and having a view of this man-made dam, you could have a picnic. With its picturesque view, you may be stuck there with your spouse for hours on end. Honeymoon can also be all about touring! If you're going to be at Abuja for your honeymoon, you could also go to Gurara falls located in Niger state. Not to worry, it's less than a 2-hour drive. If you've ever had doubts about the beauty of Nigeria, perhaps a visit to this place can convince you. It's also perfect for picnics and swimming. However, always remember to be cautious especially when you're going during the rainy season. Make sure to be closer to the large smooth rocks further downstream with the smaller pools. Sometimes, all you and your spouse need is a little peace and quiet. The Ado-Awaye Lake can give you this and more. Asides its serenity, this is the only suspended lake in Africa. Located in Oyo state Nigeria, this place is perfect for a picnic and organic day. Located in Kaduna State and built over 20 years ago, this castle is both mystical and royalty. What’s more is that you and your spouse can hide away from the world in this place. Just imagine almost everything a castle should have. If you’re looking more into a fairytale honeymoon, this is perhaps one of the places you should be considering.